The PPS23 keychain model is a special edition version of our popular PPS23 series. For this special limited edition unit, in addition to the colors available, we've included a keyring and a bag clip. We believe this unit is the ultimate personal alarm for purses, backpacks, and car keys. The PPS23 is a dual function emergency attack alarm. It features a 130dB alarm, which is one of the loudest personal alarms sold by Vigilant. 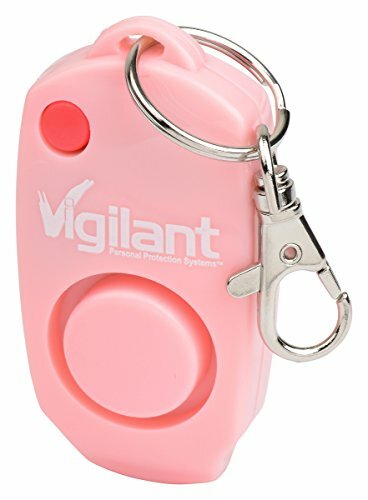 It is also the only alarm sold by Vigilant to include a backup feature - it has a security screamer whistle built into the end of the alarm that serves as an emergency backup alert mechanism in the event of battery failure. The alarm is activated by depressing the button on the front of the alarm, but a different button on the back of the unit is the only way to deactivate and silence the alarm. In situations where seconds make a difference between life and death - the ease of activation combined with the "hidden" off button make this alarm an easy to use, and hard to defeat personal alarm. Personal alarms are one of the fastest growing segments at retail in the self defense industry, because an attacker's worst enemy is attention. Personal alarms are legal to carry in all 50 states (even on airplanes!) and are a very safe method of self defense. They require no training or skill to operate, and can be used by anyone regardless of age or physical ability. Victims are often too traumatized to shout for help in unfamiliar and dangerous situations, increasing their vulnerability. Criminals do not like to draw attention, and will likely run off when they realize the alarm cannot be stopped.The PPS23 is particularly suitable for teenagers, parents, night owls, delivery route employees, business owners, and college students. Joggers, walkers, and bicycle riders may enjoy the backpack/purse clip for hands free carryingMACE is a registered trademark of Mace Security International, Inc. All images and advertising copy 2017/2018. The PPS36 Window/Door Alarm is one of the loudest rated wireless door alarms on the market at 120dB. A 120dB alarm is 100x louder than a 100dB alarm. You and prospective burglars won't miss the fact that the PPS36 has been alerted from it's armed/ready mode. It's easy to install using the provided double sided adhesive tape, and included AAA batteries make the unit wireless and compatible with any door or window. Once set to "Guard" mode, the 120dB siren will be activated if the glass or door is hit or knocked. The siren will sound for 45 seconds, and then will auto reset. The next time the alarm is activated, the siren will sound for 25-35 seconds. This sequence will keep the system armed while preserving battery life, keeping the batteries from draining to zero on a false alarm or in the event you are not there to reset it. Variable sensitivity also puts you in control of alarm sensitivity for high risk areas vs. high activity access points. Vigilant also includes a burglar warning window sticker, which can be placed on the inside of any window facing out. "Warning! Electronic Security System in Operation" The adhesive is rated to a room temperature of 30F. The adhesive runs the full length of the back of the device, and is suitable for all normal residential installations, and commercial installations in all areas other than cold storage where indoor air conditions may fall below freezing. One tip for permanent installations in harsh conditions is to add a few drops of superglue to the adhesive during installation, but for most normal residential installations --- even through the colder Midwestern states --- the included adhesive will handle all but the most abusive conditions. The PPS36 is a low cost, "do it yourself" access point protection alarm with no monthly monitoring fees and wireless installation MACE® is a registered trademark of Mace Security International, Inc. All images and advertising copy © 2017/2018. All rights reserved.